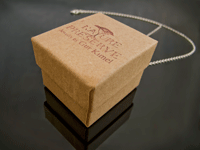 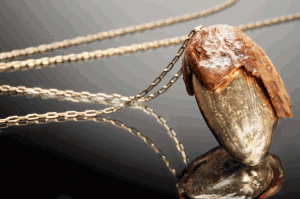 …One such designer, Gur Kimel, is something of a contemporary forager: He collects acorns, pinecones and other tree branches around the Jerusalem hills, Tel Aviv and Scandinavian villages – and then coats them in 24k gold or sterling silver to create one-of-a-kind pendants. 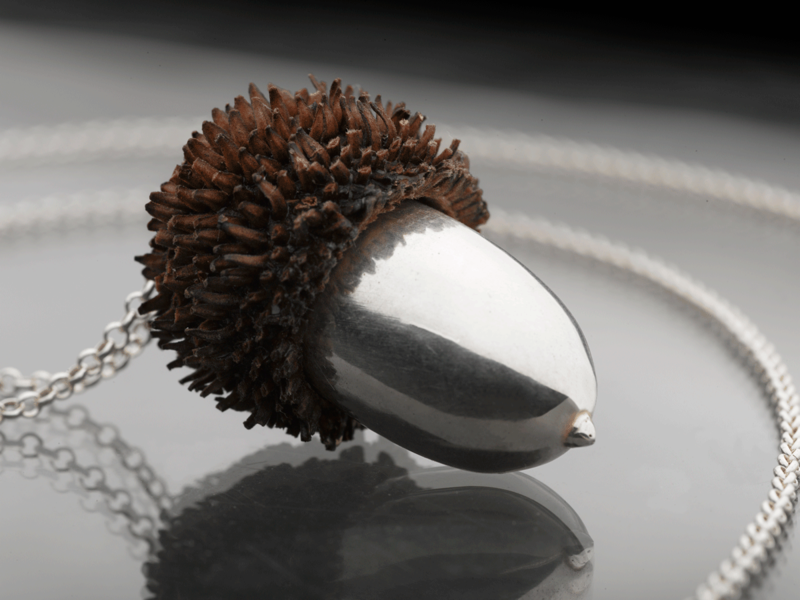 Kimel’s works create a lovely contrast between the natural and the manmade: One necklace, for example, tops a silver-coated acorn with its natural shell, highlighting the different textures. Yet the standout pieces are the designer’s nut necklaces: Gold- and silver-adorned almonds and pecans that can be worn alone or with part of the original wooden shell. 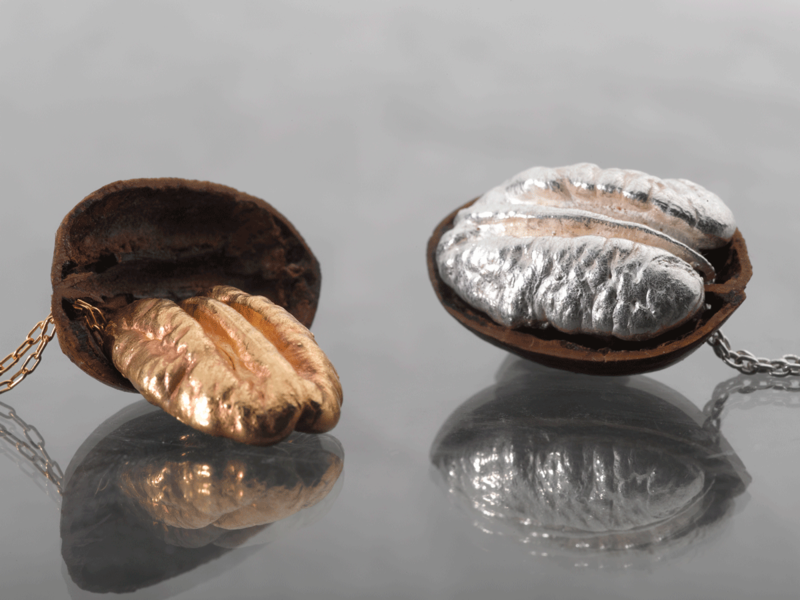 The almond pieces were partly inspired by a Scandinavian Christmas game in which an almond is hidden in a big bowl of rice pudding; it must be found before moving on to the evening’s entertainment – and, like the kid who finds the afikoman on Passover, the lucky diner gets a prize. But Kimel has a soft spot for the pecans, which transport him back to his grandparents’ moshav and a “fun field” from his childhood, where he collects the pecans used in his designs to this day. 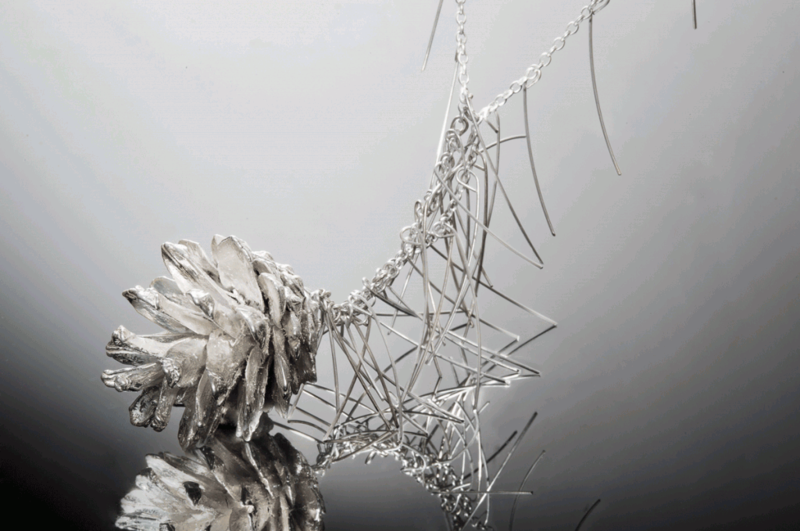 Many an artist has tried painstakingly to recreate the beauty of nature but it always manages to remain slightly elusive – perhaps illustrating the fact that there is nothing more beautiful than nature in its element. 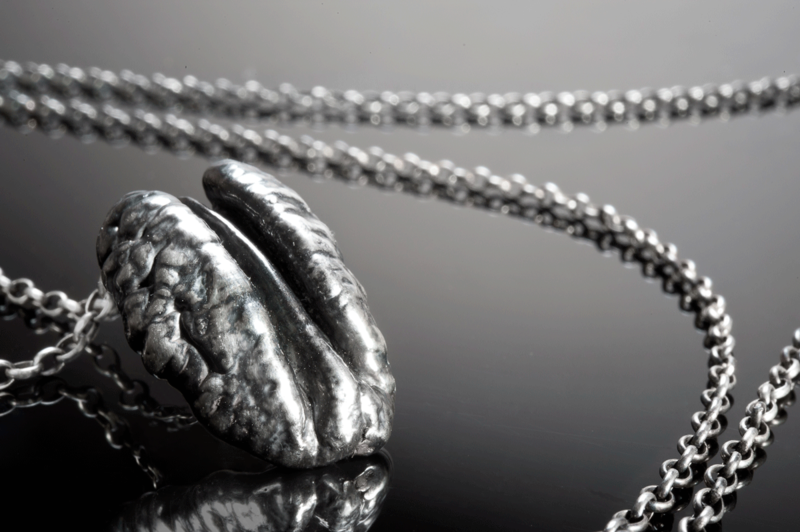 Israeli jewelry designer, Gur Kimel, chose instead to collaborate with nature rather than try to replicate it. His Simply Nature collection of necklaces features fallen acorns plated in 24 k gold and pure sterling silver, juxtaposing the rustic charm of the acorn with the luxury of precious metals. 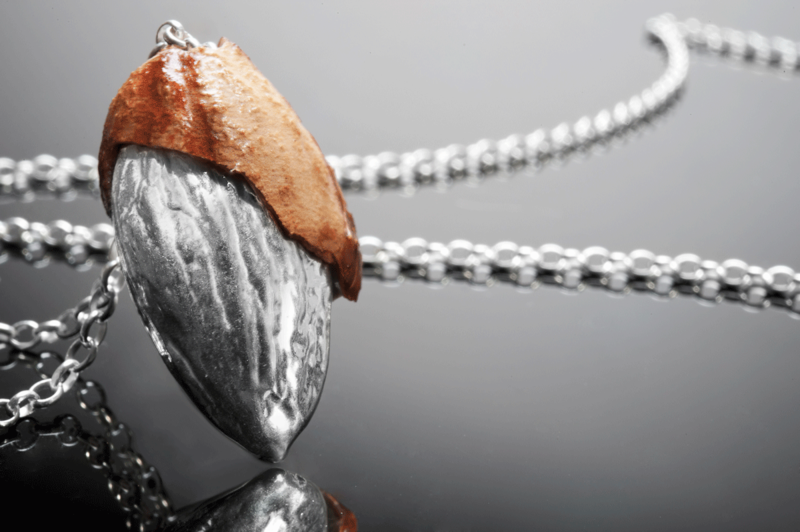 ‘Nature Preserve’ is a jewelry collection by Tel Aviv-based designer Gur Kimel, that integrates mementos and motifs from hills in Jerusalem, European forests and Scandinavian villages. Depending on the season, each piece tells a different story based on the location where it was conceived. 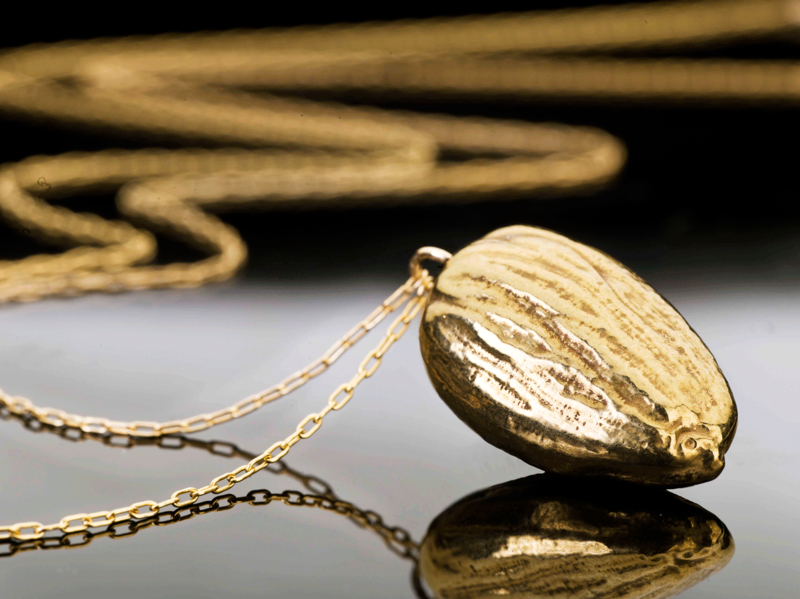 The combination between natural elements and gold or silver produces a thrilling contrast—the movement of a silver acorn in its wooden shell, the complex shape of a pecan, the pinecone’s natural position on a golden branch, all highlight the intricate detail of organically occurring creations.